Whether due to standard seasonal rainstorms or unexpected catastrophic flooding. Mold growth is one of the frustrating and potentially devastating issues that any home or business owner can face. The discoloration and unpleasant odors caused by mold and other microorganisms. Have often required costly remediation efforts. While greatly inhibiting the enjoyment of your home as well as impairing the resale value. However, many solutions on the market only address part of the problem. Mold products can kill current mold infestations. But they don’t guard against further mold spread. For example, bleach can kill surface mold but can’t prevent re-germination. After careful research, we have developed the TSSPRO-700CS to combat the spread of mold and mildew. Ensuring that your surfaces remain mold, mildew, and algae free for years to come! 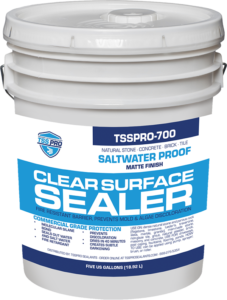 In this post, we are going to highlight the benefits of the TSSPRO-700CS sealer. This revolutionary silane-based sealant offers a wide range of benefits for indoor and outdoor surfaces made of both natural materials and man-made products. In particular, this powerful sealant is capable of preventing mold from germinating. And spreading on almost all types of materials, from sheetrock, wood, and masonry to stone, plaster, and vinyl. How does TSSPRO-700CS work? This sealant penetrates the surface onto which it is applied at the molecular level, bonding to the surface and forming a durable, waterproof barrier that will not weaken over time. This barrier then suppresses mold homeostasis by encapsulating any existing mold and cutting it off from oxygen, food, and water –effectively cutting off any future mold infestations as well. This functionality is a key component of what sets TSSPRO-700CS apart from other mold products on the market. It is not a pesticide, and it does not merely kill existing mold. Instead, our powerful sealant acts as an effective mold preventative, stopping both existing and returning mold colonies. TSSPRO-700CS is particularly effective for homes or businesses recovering from a flood. Among the many issues that a flood can bring are mold and mildew growth. A single application of TSSPRO-700CS directly onto any mold-infected surface can cut off the rapid spread of mold that can occur in the particularly damp conditions following a flood. However, the benefits provided by TSSPRO-700CS go beyond water protection and mold removal and prevention. This sealant also retards the spread of fire on combustible surfaces, allowing materials that are coated with TSSPRO-700CS to retain their strength and integrity longer–even in the face of direct flames. Furthermore, TSSPRO-700CS provides resistance to decay and rot, including insects and many termite species. The longevity of TSSPRO-700CS also ensures that once you coat your home or business’ surfaces with this sealant, you can enjoy years of protection maintenance-free. One 30-minute application can provide up to a five-year barrier against mold, mildew, and algae without any risk of harm to humans or pets. In short, our revolutionary sealant offers the ideal solution for any homeowner or business concerned about mold–whether they’ve already experienced flooding or are simply looking to avoid the effects of excess moisture going forward. Our sealants are the best on the market to make sure that your surfaces last for decades. Give us a call today at 888-958-0556. To speak to our friendly specialist and how we can help you with all sealing needs. Or visit our website at https://tssprosealants.com/. We can’t wait to provide the solutions to your sealing needs today!